My sewing machine. 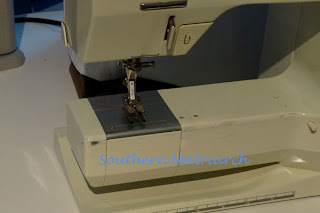 Sew Mama Sew has been celebrating sewing machine month throughout June. I of course have been uber busy with a christening gown and didn't get a chance to do this earlier in the month. But here is my sewing machine meme. How long have you had it? I have had this machine for 19 years. And she is still going strong. How much does that machine cost (approximately)? I paid $2000 for both my machine and basic entry level serger. Serger has since died. What types of things do you sew (i.e. quilting, clothing, handbags, home dec projects, etc.)? I do mainly heirloom sewing and smocking for children and babies. How much do you sew? How much wear and tear does the machine get? I, like many, go in spurts, where I will sew and sew and sew and then for a few weeks won't touch it. I almost always have at least one thing in the works. How much wear and tear does it get? Well you can see there to the left of the throat plate I have worn the paint down to the bare metal. For a couple of years I did piece work and hundreds of flags. My last machine cabinet the machine sat down in the cabinet, all that stitching vibrated the machine against the wall of the cabinet and wore the paint right off! And see that purple stripe tight above the needle? That is from hundreds of hours of thread passing along the machine front, it dyed the paint. Do you like/love/hate your machine? Are you ambivalent? Passionate? Does she have a name? I LOVE my machine. Even if I get a new one, I will never give up my 1130. What features does your machine have that work well for you? I love the balanced straight stitch and the fact that I know it so well I can usually troubleshoot most problems. Is there anything that drives you nuts about your machine? It won't cut out or clean up after itself. Do you have a great story to share about your machine (i.e., Found it under the Christmas tree? Dropped it on the kitchen floor? Sewed your fingernail to your zipper?, Got it from your Great Grandma?, etc.!)? We want to hear it! When I bought my machine I had to finance it. When I called the bank, back when banks knew your name, the loan officer asked the price of the machine. When I told him, he gasped and said, "Martha, that must be some nice machine!" Little did he know what the price of sewing machines would be today. Would you recommend the machine to others? Why? YES! Wholeheartedly. It is a workhorse of a machine, has Bernina's legendary metal shuttlehook and can go and go and go. What factors do you think are important to consider when looking for a new machine? That it has the features that YOU would use. If it does a great pin stitch but that is something you would never use, of what use is that to you? What kind of sewing do you do? Match the machine to that, and then go a little beyond that so you can grow into what the machine can offer. Do you have a dream machine? I will admit to lusting after that newest Bernina 830. But sadly there isn't $10K in the budget for that right now. So there you have the story of my machine. What about yours? I love my Bernina, too. It is a 440QEE, so I call it the Queen Elizabeth II (QE2). I am with you...wouldn't trade it for anything. And though the 830 is a whiz-bang machine, I'd sooner put the $10K toward my OTHER dream machine...an AGA 4 Oven Cooker. One day! Yeah, I've learned not to be so gulible anymore. Oh and that dealer went out of business shortly after I bought it also. When a local person sold her 1630 (which DOES have the capability to embroider letters - but that's another story)for a good price, I snatched it up. I assured my dh that I would be selling the 1130, but unfortunately, I don't think I could ever get for it what it's worth, so I'm hoping at least one of my dds will want it some day. how much did the 1130 cost when it first came out? Another assertion that she won't be giving up the old one when she gets a new one. And she says she loves us. I still have my Bernina 930, which is a workhorse, but have to admit that I also have a new 830. It's a dream of a machine and although I've had it 1.5 years, I still don't think that I'll ever learn all it can do! 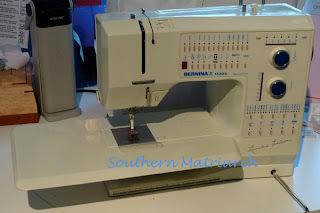 I bought my Bernina 1130S used in 1995 and would never, ever part with it. I love it! It's an absolute workhorse. Thanks for the wonderful article and testimony to a top-of-the-line machine!